Gihahn Cloete was born in Atlantis on the 4th of October in 1992. He is a left-handed batsman who also plays wicketkeeper. Gihahn prides himself on being the jokester and entertainer of the team. If he isn’t making everyone laugh he is probably having a dance battle with Aya Gqamane. On his off days he is usually playing golf, braaiing or having potjiekos with family and friends. His favourite meal though is rump steak and cheddar melt cheese sauce and he loves the fact that he can play cricket, the game he loves, every single day. His favourite cricket players are Matthew Hayden and Kumar Sangakarra. 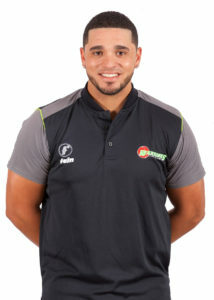 He has played for Free State, Knights, South Africa Under 19s, South Africa A and currently the Warriors Cricket team. If he wasn’t a cricketer, he would be a rugby player as he played rugby in school where he would sneak out and go play mini cricket. In his 100 First-Class matches, he has top scored with 135 runs at an average of 30.52. In 2015 he was included in the Eastern Province Africa T20 Cup squad. He made his First-Class and List-A debuts in 2009 and his T20 debut in 2011.